The word influencer is held in high esteem in the marketing world. Marketers are scrambling to win over influencers, or they are seeking influencers to market their brands. In a poll of 125 marketers conducted by online promotions firm Tomoson and reported in Adweek, marketers rated influencer marketing as the fastest growing online customer acquisition tactic above organic search, paid search, and email marketing. Marketers need to take a very close look at the Latina market, as they are hyperinfluencers that friends and family rely on for guidance. 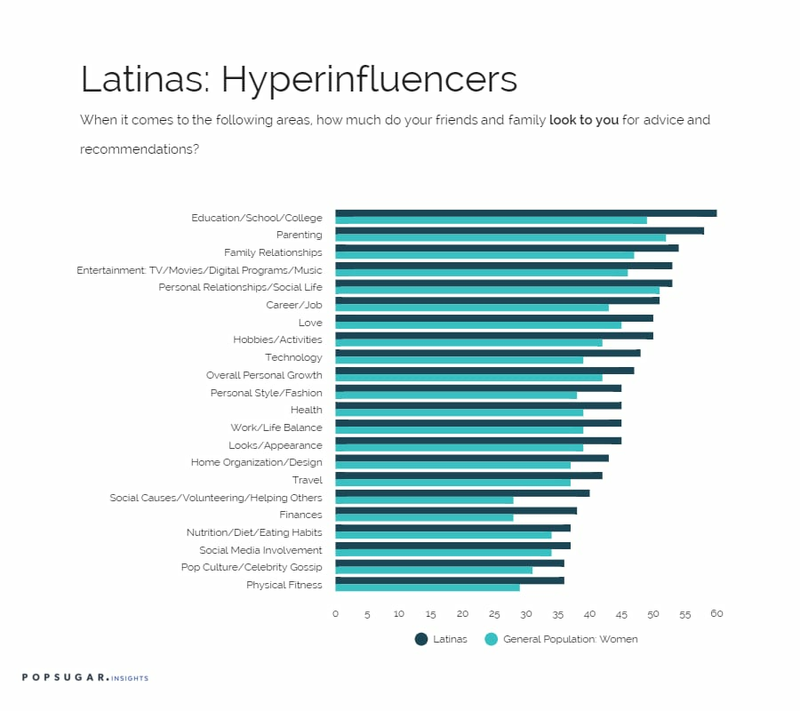 As part of the POPSUGAR Insights 2015 Hypercultural Latina study, we asked Latina women to define the areas in which their friends and family come to them for advice and recommendations. At the top of the list are education (60%), parenting (58%), and family relationships (54%). It is well known that in the Latino culture, family is most important. But their influence does not stop there; they also give advice on entertainment (53%), technology (48%), personal style and fashion (45%), health (45%), and travel (42%), proving that Latinas are as passionate about lifestyle topics as women in the general market, if not more so. In fact, Latinas are more influential than women in the general US population in nearly every topic we explored in our study. The largest influential differences are social causes, where 40% of Latinas are influential vs. 28% of women in the general US population. The same delta is seen in finances, with 38% of Latinas having influence with friends and family in comparison to 28% of US women. Latinas' breadth of influence is vast and they are passionate about lifestyle topics, giving marketers in any industry an opportunity to tap into an unprecedented audience that people rely on for advice and recommendations.